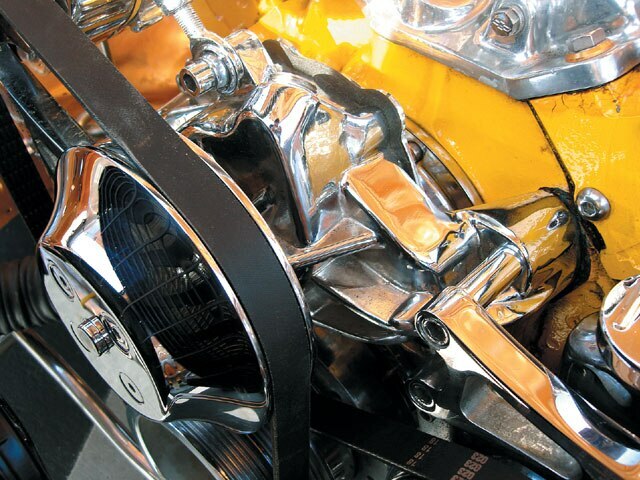 Customized Engines Have Specialized Cooling System Needs. 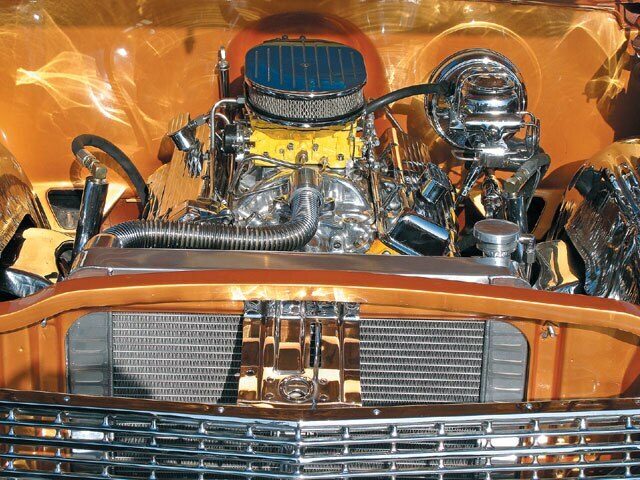 Those of us who have so much chrome under our hoods are always looking for a way to keep our engines cool. This means spending money, but with so much money tied into the project already, what’s a few more dollars, especially when it’s spent on something as essential as a cooling system? Basically, the purpose of the engine’s cooling system is to remove excess heat from the engine and to keep the engine operating temperature at its most efficient level. Most of the liquid cooling system removes about a third of the heat that’s produced in the combustion chamber. The exhaust system removes the biggest share of the heat, however, the internal parts of the engine, such as the cylinder walls, pistons and cylinder head, absorb large amounts of heat. If these parts of the engine get too hot, no oil in the world will protect it. The cooling system is also required to prevent the internal engine parts from melting due to the heat of the burning fuel. If the engine ran hot, the pistons would expand so much that they couldn’t move in the cylinders, resulting in a seized engine. This is the main thing that happens when an engine runs hot. Most of today’s engines need to start and warm up to the correct temperature as soon as possible after starting. On the other side of the coin, if an engine runs at too low of a temperature, it’s wasteful as the oil gets contaminated, sludge forms and fuel mileage decreases. It will also raise the emission levels above specified limits. The right temperature for your engine is so important that most of the engine builders that we’ve talked to say that 220-225 degrees is the ideal temp to run your engine; this is usually hard to do with all of the chrome goodies under the hood. Excessive heat under the hood of lowriders has always been an issue. The main part of the problem is that the engine produces heat and it gets caught in the walls of the chrome finish. The antifreeze is then trapped and can’t do its job in keeping things cool. There are several ways that lowriders combat this cooling problem; usually by trying to find the right antifreeze coolant mix or adding a high-flow water pump. These are a few inexpensive ways to cool off your engine. Whatever the case, we’re going to try to give you some cool pointers for your lowriding machine. This engine is the perfect example of how today’s lowriders look under the hood with all of the chrome and paint combinations. The quickest cooling tip is to add a high-flow water pump that will keep your fluids flowing through the engine and cooling radiator. You can also use an aftermarket pulley or pulleys that will “trick” the pump to flow more fluid with more producing more revolutions or sometimes less depending on the manufacturer’s temperature recommendations. Antifreeze protects the cooling system against both freezing and boiling over. When used at normal strength (50-percent antifreeze, 50-percent water), it can lower the freezing point of the coolant to -34 degrees F. and raise its boiling temperature to 276 degrees F. Never use straight antifreeze in a cooling system. Always mix it with at least 50-percent water. Most antifreeze is 95-percent ethylene glycol (EG). 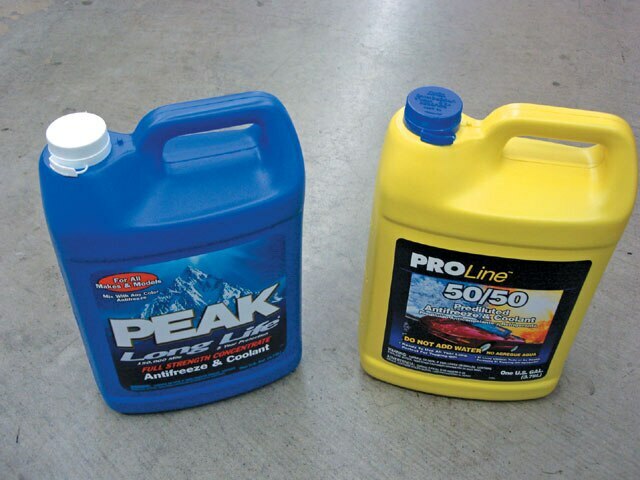 The only differences between brands of antifreeze are the type and/or quantity of anti-corrosion additives used. Ethylene glycol never wears out but the corrosion inhibitors do. That’s why antifreeze should be changed every two years (except for long-life antifreezes, which have special additive packages that allow them to go up to five years/150,000 miles between changes). For the environmentally concerned, propylene glycol (PG) antifreeze is also available at slightly higher cost. PG antifreeze is less toxic than ethylene glycol. 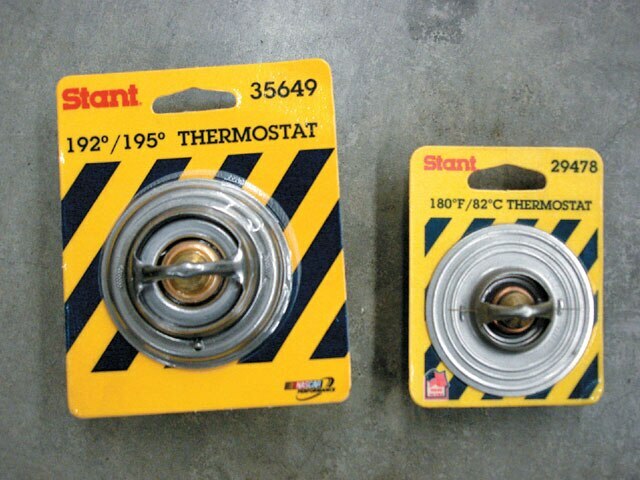 The thermostat is the valve located in the cooling system of an engine, designed to stay closed when the engine is cold and gradually opening in response to engine heating, and controlling the temperature of the coolant and rate of coolant flow.